TRADITIONAL fibre couplers can be notoriously labour-intensive to align, says Siskiyou, adding that the superior adjustment orthogonality of its SMFCx series of opto-mechanical positioners allows for optimal fibre coupling efficiency with minimal effort. 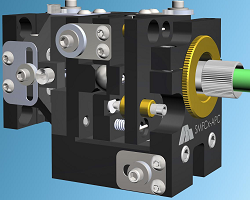 The SMFCx series enables the coupling of fibre optics with a combination of ease of use, high precision, and full six axis adjustment in a compact package, the company says. SMFCx products accept fibres with FC/PC, FC/APC, or SMA connectors. They and employ a precision aspheric lens to either focus in a collimated laser beam or collimate fibre output. Near diffraction limited focusing make SMFCx positioners useful with both single mode and multimode fibres. The miniature translation stages and gimbal mounts used in the SMFCx series deliver true, independent, orthogonal adjustment in all three linear dimensions, it says, as well as tip/tilt angular adjustments. The fibre itself can be rotated (the sixth adjustment axis) to control orientation when using polarisation preserving fibres. The 100 TPI (threads per inch) actuators enable submicron resolution in all dimensions, delivering rapid and reliablr fibre coupling with minimal effort. Locking mechanisms in all adjustments ensure that alignment is maintained without drift, and without mount movement when first engaged. These compact couplers, measuring roughly 59x46x33mm, which can be mounted directly to an optical table, mounting plate, or laser cavity platform surface. Standard optics are available for laser wavelengths throughout the visible and near infrared. The products are intended for a range of laboratory and OEM uses in research, biotechnology, and telecommunications applications.